The 2016 5th Edition of the Template for Comprehensive Business Continuity Management to Enhance Your Organization’s Resilience is designed to assist you with the development of a comprehensive Business Continuity Management program. The templates will enable you to collect information and evaluate the business environment, identify and reduce risks, analyze business operations, analyze alternatives to respond to disruptions, develop a comprehensive Business Continuity Plan, develop plans to prepare for and respond to hazards-specific events. How do we get started and where do we begin? How do we reduce risk and improve business resiliency? What analysis do we need to perform? How do we respond to an emergency and what are our priorities? What actions do we take first? How can we protect our business assets, maintain critical operations, recover normal operations and protect our workforce? The 5th Edition of this comprehensive template/toolkit has the answers! 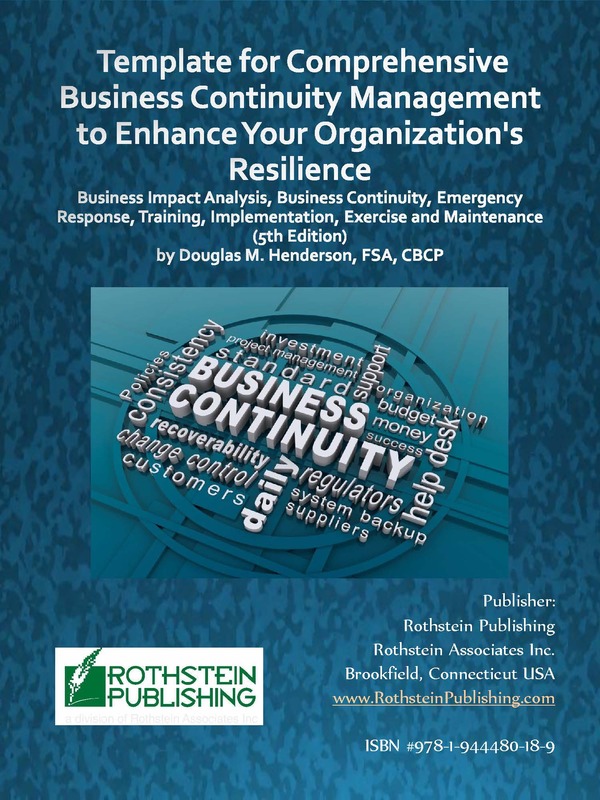 The Template for Comprehensive Business Continuity Management to Enhance Your Organization’s Resilience identifies step-by-step solutions to these and to other important questions. There is substantial standard language that enables the user to easily review and edit-out text. The program has evolved over several years and has received extensive field testing. Information Gathering – gathering data and risk identification. Analysis – Business Impact Analysis, Risk Assessment and Strategy Development executive management reports. Business Continuity Plan (BCP) – the central or overarching plan for the business. Department Plans – function-specific plans for key support departments and operational groups. Crisis Management Protocols – a hazard-specific set of actions to be taken during each of the four phases of emergency management (Prevention / Mitigation, Preparation, Response and Recovery). Implementation and Maintenance – implementation steps, employee distributions, exercises, update and audit steps. Follows the guidelines recommended by the Disaster Recovery Institute International, Business Continuity Institute Good Practices Guidelines, NFPA 1600 Standard on Disaster / Emergency Management and Business Continuity Programs and industry best practices. 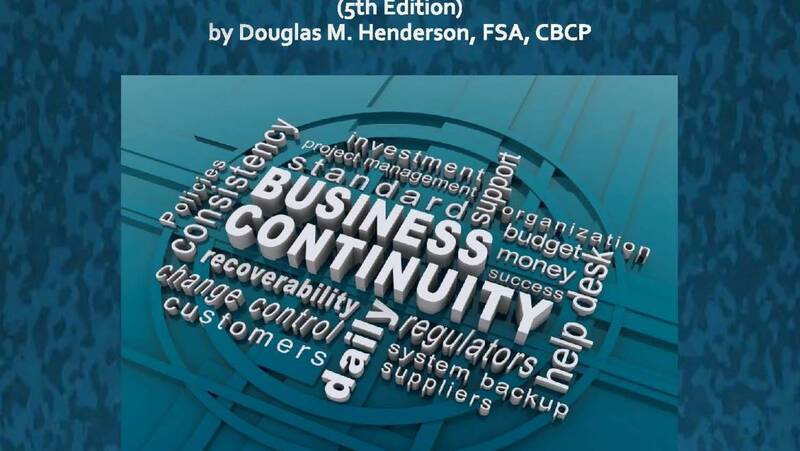 The Business Continuity Template for Manufacturing and Distribution (2nd Edition) by Douglas Henderson is designed to assist you with the development of a comprehensive Business Continuity Management program. The templates will enable you to collect information and evaluate the business environment, identify and reduce risks, analyze business operations, analyze the supply chain and develop alternatives to respond to disruptions, develop a comprehensive Business Continuity Plan, develop plans to prepare for and respond to hazards-specific events. $499.00 (downloadable). To reduce the probability of a crisis event occurring. To mitigate the impact of a crisis event for crisis events that can not be avoided. After the crisis event to return to normal operations. The planning templates are written in easy-to-use Microsoft Word designed with “fill-in-the blank’ and “edit-out” text. Delineates an organizational structure designed to interface with the organizational structure of civil emergency responders. Establishes clear guidelines for program activation and operation. Synchronizes and coordinates the responsibilities and activities of the major departments that comprise the organization. Develops planning for twelve major departments (Academic Affairs, Auxiliary Services, Business Services, Environmental Health and Safety, Facilities, Finance and Administration, Human Resources, Information Technology, Public Relations, Residential Life, Security and Student Affairs). There are special templates that focus on safety and security issues for faculty, staff and students. Douglas M. Henderson, FSA, CBCP, has 20 years of experience in the management and human resources fields with major consulting firms. In August of 1992, Mr. Henderson was the key associate of the Emergency Response Team for a consulting firm located in South Miami-Dade County. Inspired by the real life business experience with Hurricane Andrew and the lack of preparation within the business and academic community, Mr. Henderson founded Disaster Management, Inc.
Mr. Henderson’s clients include Bombardier Capital Group, CP Ships, Discovery Channel Latin America, Intek Plastics, Kemper-NATLSCO, Professional Golfers’ Association (PGA), University of Miami, United Educators Insurance Company and numerous other organizations of all sizes. The activities he has undertaken on behalf of these organizations includes Site Inspections, Risk Assessments, Business Impact Analyses, Strategy Developments, Business Continuity Plans, Emergency Response Plans, facilitating Tabletop Exercises and more. Mr. Henderson has a Degree in mathematics from the University of Arizona, a Fellow – Society of Actuaries and a Certified Business Continuity Professional. Mr. Henderson is the author of the book Is Your Business Ready for the Next Disaster? and the following planning templates: the Business Continuity Plan for Higher Education, the Continuity of Operations Plan for Colleges and Universities, the Continuity of Operations Plan for Public & Private Schools (K-12), the Complete Hurricane and Flood Plan, Comprehensive Business Continuity Management Program and other planning templates. Mr. Henderson is the coauthor of the textbook Business Continuity and Risk Management: Essentials of Organizational Resilience. Mr. Henderson is also a frequent speaker and contributor of articles to professional magazines and journals.